​This is what Romy had to say about receiving the 2017-18 Junior Scholarship " It's has been an honour to be a part of the 2017/18 SCTA Junior Scholarship program this season. Not only has it allowed me to progress in triathlon through the support of the Sunshine Coast Triathlon Academy and of course Head Coach Toby Coote; but also, through the ample support provided by the sponsors that enables the club to thrive like it does. With their support, Jake and I were able to travel Australia competing in some of the best gear and having access to the best accommodation. This has helped us financially and to set us up for continual sponsorship and endorsements. The scholarship program educated me about how to work with sponsors, media and has provided me with a great platform into the U23/elite scene and I cannot wait to begin next season". This is what Jake had to say about receiving the 2017-18 Junior Scholarship "The Sunshine Coast Triathlon Academy (SCTA)/ Protector Aluminium Junior scholarship is an amazing opportunity to work with, promote, grow with all the SCTA sponsors and follow in the footsteps of previous SCTA scholarship holders. It is a very humbling achievement to be awarded with this Junior Scholarship and it is one that I couldn’t be more thankful for. Lastly and certainly not the least all this could not be available without Head Coach of the Sunshine Coast Triathlon Academy Toby Coote with his constant supervision, guidance, mentoring and determination to help people achieve their goals to represent the brand of SCTA and himself – Thank you Toby for everything you have done and will continue to do for me personally and in the sporting field. This is what Kaya had to say about receiving the 2016-17 Junior Scholarship " Receiving the SCTA/ Protector Aluminium Junior Scholarship was an amazing opportunity which helped me develop as an athlete. It was a great experience to work closely with Head Coach Toby Coote and the SCTA junior scholarship sponsors. The scholarship was a huge help both financially and mentally because I knew I had the support of the whole club behind me. It was certainly an emotional season with a touch of broken arm to top it off. But with the help from the scholarship I was able to keep going and secured a spot on the QLD nationals team. Overall it was a great year and I’m honoured to have had such an extraordinary opportunity. ​I would recommend applying for the scholarship, especially if you are struggling financially or just need a boost of motivation. The scholarship is perfect for anyone who puts their heart and soul into training, no matter your speed. ​This is what Ryan had to say about receiving the 2016-17 Junior Scholarship "
This is what Savannah had to say about receiving the 2015-16 Junior Scholarship " Receiving the Sunshine Coast Triathlon Academy (SCTA) / HCAUS junior scholarship was an amazing experience that helped me through my final year of juniors. During that season I competed at an international level and without the extra hand from the supporting sponsor that experience would have not been the same. I was extremely grateful when I arrived in Adelaide, that my accommodation, shoes, uniform and many small things had been sponsored for me. With challenging training schedule, it was extremely satisfying to know you had that team around you. Without Toby Coote and all the incredible sponsors I don’t think I would have achieved half of what I did in the 2015/16 season. Therefore, the support of all those fantastic sponsors over that year has been helpful not only financially but both mentally and physically as well. This scholarship isn’t about being the fastest or fittest, it’s about the person who shows passion in their training sessions and racing. If you are junior who has a love for triathlon I recommend apply. It was an amazing experience. This is what Jake had to say about receiving the 2015-16 Junior Scholarship " The Sunshine Coast Triathlon Academy (SCTA)/HCAUS Junior Scholarship was an honor to receive as I had the privilege and a sense of Pride to be selected to follow in the footsteps of some very talented athletes who also had this amazing opportunity before me. This scholarship was an enormous help not only with my Junior Triathlon racing but also for myself and my family for the 2015-2016 triathlon season. The support from all the sponsors of the junior scholarship has encouraged me to train and race harder not only to gain results for myself but for the sponsors as triathlon isn’t the easiest sport to compete at high levels both financially and personally. With the Scholarship there is an added commitment to perform well for the sponsors as well as my supporting network. The Junior scholarship has allowed me to concentrate on my training and racing as race entries, places to stay and fantastic products from SCTA/HCAUS were provided for me. The financial support provided by the scholarship was an enormous help, financially and for my training. So, a big thank you is needed for all the sponsors and supporters that helped me for the 2015-2016 triathlon season. The sponsors apart of the SCTA/HCAUS junior scholarship have given me the opportunity to perform to the best of my abilities. Everything from triathlon essentials from Cannibal Australia and SCTA who have provided me with awesome gear throughout the 2015-2016 triathlon season, that not only looked good but also improved my speed in my big races, to Endura sports nutrition which helped me stay hydrated leading into a race, during a race and help recover after the race, to X-terra/Titan performance group providing #freespeed with the Speed suit, wetsuit, water bottles and cool stylish puffer jackets. I recommend applying for the SCTA/HCAUS junior scholarship if you wish to have this unbelievable chance at obtaining this overwhelming benefit of the SCTA/HCAUS junior scholarship for 2015-2016. Lastly and certainly not the least all this could not be available without head coach Toby Coote constant supervision, guidance, mentoring and paving the way for me to represent the brand of SCTA and himself – Thank you Toby for everything you have done and continue to do for me personally and in the sporting field. 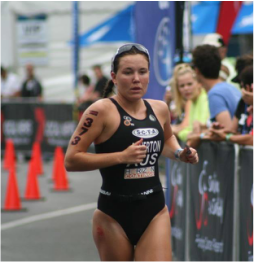 This is what Lucy﻿﻿ had to say about receiving the 2014-15 Junior Scholarship "Receiving the Sunshine Coast Triathlon Academy (SCTA) / Hybrid Concepts Australia junior scholarship has been a huge help with my junior triathlon racing this past season. The support of all of the fantastic sponsors over the past year has been helpful not only financially but both mentally and physically as well. Being a senior student in High School is stressful and with the assistance of the scholarship it has taken the pressure off my study and training. It has allowed me to concentrate on my training, racing and study as race entries, places to stay and fantastic products from SCTA/HCAUS were provided for me. The financial support provided by the scholarship was an enormous help as triathlon is not exactly the cheapest sport to do. So, having the support from Head Coach Toby Coote, Jason Brown from Hybrid Concepts Australia and the fantastic sponsors was great to have. The training is tailored to suit everyone whether you are an ironman, Olympic distance, sprint distance triathlete or you are in the junior series like me. Having a training program which is tailored specifically for everyone and is based around important races is amazing and takes the pressure and stress off the athletes. The SCTA/HCAUS scholarship isn’t about the fastest, fittest or strongest, it is about the junior who is looking to improve and may even need financial support. If this is you I would most definitely recommend applying for the junior scholarship! This is what Will﻿﻿ had to say about receiving the 2014-15 Junior Scholarship " I received the Sunshine Coast Triathlon Academy Junior Scholarship in the 2014 – 2015 season and with scholarship I was able to increase my understanding and appreciation of the sport. The scholarship provides athletes with access to elite level coaching and help from generous sponsors who donate their own products to help enable athlete’s to excel to the best of their ability. Training under the watchful eye of SCTA head coach Toby Coote, I was able to learn many skills and techniques that I have been able to pass onto my own athletes that I now train and coach. The SCTA Junior scholarship enabled me to rise to a level of triathlon where I had never dreamed of achieving on my own and for that I am forever grateful to have been given this opportunity. One of the greatest aspect about having the SCTA scholarship was having the ability to train with a great group of athletes who specialised from marathon runners to Ironmen and women. With such a diverse and specialised group of athletes there was always someone to push you to your limits to ensure that you got the best out of your own self every session. As well as being competitive it’s also a very supportive and understanding environment to train, nurturing and guiding athletes in a positive direction. The time I spent training under Tobe’s years of experience and race knowledge helped me learn the respect and discipline I needed to know to grow into the swim coach that I am today. I can not recommend SCTA enough to anyone looking to get into triathlon. 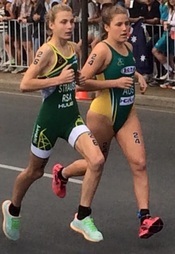 It’s a great squad and the Junior Scholarship is an invaluable to any up and coming Junior athlete’s. Thanks’ for the Rippa opportunity Tobe’s. Jake Freeman was the SCTA / Hybrid Concepts Australia Junior Scholarship Recipient for season 2013-14. This is what Bonni﻿﻿e had to say about receiving the 2012-13 Junior Scholarship "Receiving the Sunshine Coast Triathlon Academy (SCTA) / Hybrid Concepts Australia junior scholarship was an enormous help with my junior triathlon racing. Not only financially but both mentally and physically as I was able to concentrate all of my energy into my training knowing that all of my races would be organised for me including race entries, hotel bookings and more. Gaining financial support in such an expensive sport was welcomed greatly. When you think about race entry fees, race suits, club uniforms, travel to races, accommodation if needed it really starts to add up... and that doesn’t include anything to do with your bike including servicing or pool entry which on its own is costly. Having the support from both Head Coach Toby Coote and other great sponsors, in particularly Hybrid Concepts Australia (HCAUS) was great. Knowing that you had such enthusiastic and smart people working with you to achieve your goals was great also. Knowing that you could turn up to training and Toby Coote would have a specific training program tailored to you because we would know EXACTLY which races you were doing and more importantly which races you were targeting! As Toby also reiterates, the scholarships is never about being the fastest, fittest and the person that shows the most potential. If you are a junior and are looking to give the junior season a good go, then I couldn’t recommends applying for a junior scholarship enough." This is what Michael had to say about receiving the 2012-13 Junior Scholarship "Receiving the SCTA/ Hybrid Concepts Australia junior scholarship in 2012 was extremely helpful for not only myself but my amazingly supportive family. Whilst training as hard as you can day in day out, the last thing on your mind (as a junior) is how much a race, or a piece of equipment is going to cost. Therefore, to gain that financial support from the scholarship meant full focus and attention could be propelled towards that upcoming race or key training session the next day. Having an encouraging and passionate team behind you are a hugely important step towards success in any sport, especially in triathlon. With such a demanding training schedule it was extremely satisfying to know you had that team around you organising races, flights, accommodation, training gear etc. Without Toby Coote and all the incredible sponsors I don’t think I would of achieved half of what I did in the 2012/13 season. Lastly, to obtain this scholarship was a huge honour, and I can’t thank Toby Coote , Hybrid Concepts Australia and all the other sponsors enough for all the ‘behind the scenes action’ that occurred leading up to all the races that I, and many others competed in that season.